June, September are perfect times for a paragliding tour of the alps of Austria and nearby Slovenia, and the Dolomites of Italy. Spring conditions tend to be a bit stronger with the best XC potential. By September the crowds of summer have passed, but the thermals remain. The legendary thermals of the Dolomites become flyable for us mere mortals. While there are hundreds of paragliding sites within our circle we have chosen some of the best, most scenic and unique sites for our tour. This year we will add more time in France and Switzerland. “Best day ever!” “Best flight ever!” “Awesome, awesome tour!” were some of the comments from pilots the last 3 years. We will meet in Munich the afternoon of the start of the tour. Next stop is the Salzburg area, the start of the X-Alps competition, home of Mozart and the setting for The Sound of Music. Options the first day include some sightseeing in the historic town and/or a glass off flight at the Geisberg, start of the X-Alps race. Then it’s an easy hour drive to Zell am See. Zell am See will be our base for 3 nights, where we’ll stay at the base of the Schmittenhöhe, a classic ski mountain in the winter with access to great paragliding. A 62 passenger Porsche design cable car will zip us to launch, about 4000 feet above the valley, with the storybook town and lake below. The launch has access to both an east-west valley system and the north-south valley route. Heading west we follow the route where Chrigal Maurer had his some of his longest flights of various X-Alps competitions. It is a simple XC route where even less experienced pilots can clock up spectacularly long flights. The thermals in September are not as radical as those in spring and early summer, so we will experience smoother flying conditions. There is an afternoon glass off site just west of the lake at Zell am See called Ginsberg, that provides beautiful views of the Pinzgau valley and into Bavaria. Within an hour of Zell am See is the wonderfully situated launch above Werfenweng, with a 3000 foot gain up the gondola and spectacular 360 degree views over the Dachstein range, reminiscent of the Dolomites. Kössen, an hour to the west has a gondola that takes us up about 4000 feet overlooking Bavaria and the Austrian Tirol. Other nearby options depending on weather and wind are the Zillertal, Kitzbühel and Dachstein areas, all an easy drive from our base. Next we will swing southeast driving over the most magnificent mountain pass in the alps, the Gross Glocknerstrasse. 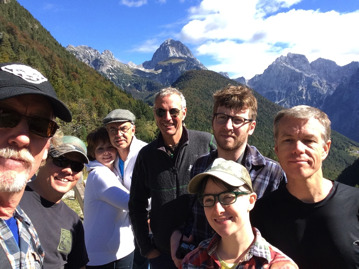 It’s about a 3 hour trip into Slovenia, for several days in the spectacular beauty of the Julian Alps. Our tour continues to the Italian foothills where we will fly Bassano del Grappa. Some tours we swing by Venice where we soak in the atmosphere of this fascinating floating city before continuing on to the wonderful flying around Bassano del Grappa, Italy. From there it is a short drive to the heart of the Dolomites where we will be flying in the most picturesque and awe-inspiring mountains in the world! We plan to fly in the Sella group, and Sassolungo and around the queen of the Dolomites the magnificent Marmolada! Our exact itinerary is flexible to catch the best local flying conditions. We had numerous XC flights in 2018 in June and September, and in September topped the tour off with a flight above the Neuschwanstein Castle near Tegelberg, Germany. France, Switzerland and the Coupe Icare! The Switzerland and France tour includes a day at the world famous Coupe Icare. It's an amazing festival of free flight, part circus, part trade show, and totally entertaining. Two years ago many tour members flew with the hot air balloons in the early morning. Last year we had nice flights the day after the festival when the crowds had dwindled. Depending on the weather we have numerous possible sites to explore. We have had some great flights near Interlaken in Grindelwald and Murren, as well as Annecy, Saint Hillaire and Chamonix, France. Last season we also flew in Passy, near Chamonix, Gourdon and St Andres in southern France and Monte Carlo, Monaco! After our last day of flying, we will all drive to Salzburg or Geneva. If you are flying out of Munich we can take you to the train station, or we can help you book a hotel in Salzburg that evening if you chose to spend the evening in Salzburg or Geneva. Fees include double room, all guiding, coaching and transportation from Salzburg or Geneva. Meals and ski lift fees are extra. Single room $400 extra. Non-flying friends and partners are welcome to come at a discounted rate. 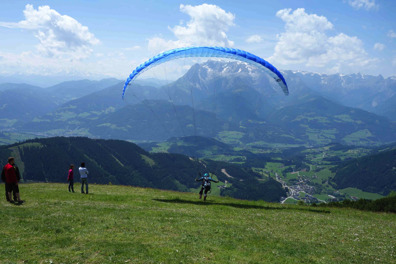 Come join us for the paragliding trip of a lifetime! Nick Crane is an advanced paragliding instructor and tandem instructor and has lead paragliding tours to 4 continents for the past 14 years. We meet in Munich and will follow the best flying conditions. For P-4 and P-3 pilots with stronger skills. We meet in Munich and will visit some of the most beautiful areas in western Europe. We will be flexible to allow for the best flying conditions, allowing time to visit some of the abundant cultural treasures along the way. For all levels of pilots. We will meet near Geneva and fly in Switzerland and France, including 2 days at the Coupe Icare. In all of our European tours we may miss flying one or two days a trip due to weather. And while our emphasis is paragliding, there is ample time to explore the cultural richness around every bend. We have been swimming in the Soça River in Slovenia and the beaches of Croatia, sampled Grappa in Italy, hiked around Dubrovnik where part of "Game of Thrones" is filmed. We have visited some of the gems of Europe, with time in Salzburg, Venice and Ljubljana. Small groups allow us more flexibility and mobility to follow the best weather conditions rather than standard tours with fixed locations. Come join us! For the Austria, Slovenia Tours we meet in Munich and end in Munich. You will have a reservation in your name at a Munich hotel where we will meet the morning of June 3 or Sept 10. All hotels are included, the first night you arrive in Munich and the last night after flying, so plan your departure for June 13 or Sept 20 or later if you plan to stay in Europe after the tour. All hotels from June 2 thru the night of June 12 are included in the tour, and All hotels from Sept 9 thru Sept 19 are included in the tour! The France and Swiss tour will start and end in Annecy, France, a short train ride from the Geneva Airport. All hotels from Sept 21 thru the night of Oct 1 are included in the tour! Plan on arriving in Geneva on or before Sept 21 and departing on or after Oct 2nd. I encourage you to arrive in Europe a day or two earlier to adjust to the time change and to enjoy the beauty and culture.